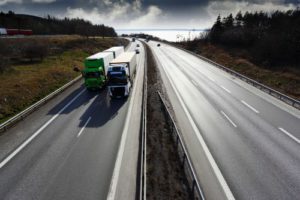 As traffic volume increases and room to operate decreases on Pennsylvania’s roads, sharing the highway with large semi-trucks is even more dangerous. Semi-trucks (also called tractors) with trailers often weigh as much as the federal limit of 80,000 pounds, which is 25 to 40 times more than most automobiles. Truckers are currently lobbying for a weight limit increase to the European limit of 97,000 lbs. arguing that this higher limit will reduce the number of trucks on the road and therefore improve safety for all. Thus, trucks may carry almost 20% more weight in the near future. Never assume that a truck driver can see or hear your vehicle. If you cannot see the driver in one of the truck’s rear-view mirrors, then the driver of a truck cannot see you. Even in the circumstance where you can see the truck driver, do not assume that the driver is paying attention. Truckers often drive long shifts and they may be tired or simply not paying attention at any given moment. Trucks have blind spots and a driver may not see your vehicle when you are behind or to the side of the truck. Keep your distance from large tractor-trailers. Because of their vast weight, trucks are incapable of making complete stops quickly. Their ability to maneuver is also limited, thus their ability to change lanes or avoid sudden highway obstructions is clearly less than that of automobiles. Always keep a safe distance from a tractor-trailer. Do not change lanes abruptly and without the use of turn signals when driving in close proximity to these types of vehicles. Pass tractor-trailers quickly since they can unexpectedly swerve into your lane at any time. Stay an assured safe distance behind the rig, at least four seconds. Pay close attention to a truck’s lane movement, turn signals, and brake lights. Always anticipate a truck’s movements. Make sure that you have enough reaction time if and when the truck changes lanes or slows down. Use additional caution during adverse road conditions. When sharing the road with tractor-trailers, all precautionary measures become far more critical during adverse or unusual driving conditions. Tractor-trailers are particularly susceptible to bad weather, detours, heavy traffic, construction zones, roads in need of repair, or other atypical road conditions such as exit ramps, bridges, obstructions in the road, or sharp curves. Be additionally cautious when driving near any tractor-trailer under any of these circumstances. If you or a loved one has suffered any type of injury resulting from any type of accident, contact Powell Law at (570) 961-0777 or visit us online. The attorneys and staff of Powell Law carry on the work of a law firm that spans generations and has represented thousands of Pennsylvanians over a period of 113 years. The consultation is free and you don’t pay any fees unless we win your case! Call today.